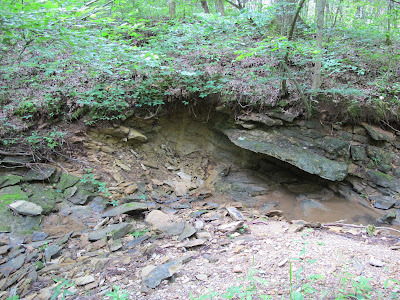 Heavy spring rains caused flood waters to tear through the creek channels at Blue Jay Barrens. 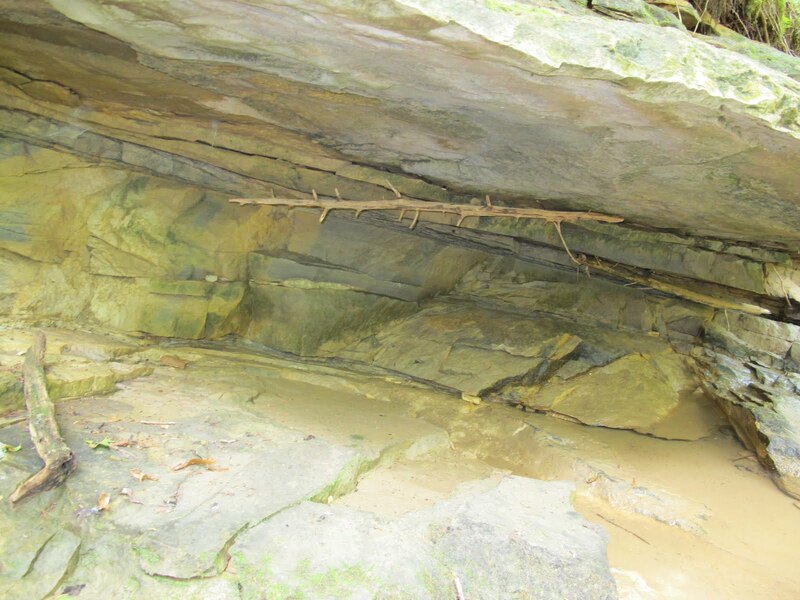 This is a point in the creek where high water slams into a rock wall and makes an abrupt 90 degree turn to the right. Water doesn’t like to turn corners and it expends a lot of its energy by tearing apart the obstacle that makes it do so. I benefit by having freshly exposed rock layers available for my personal viewing. It’s always fun to examine a new rock face. 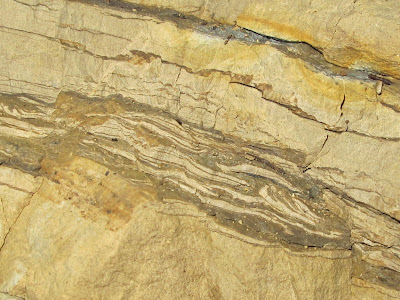 It’s sometimes hard to comprehend the fact that this material has been hidden below ground for hundreds of millions of years. I feel privileged to be the one to greet it when it is finally exposed to the light. There’s not much left to the roof of this overhang. The roots that once grew between the rock layers are now hanging down from the ceiling. I’m not sure that the rock is very stable now. I’ll have to remember this spot when I’m walking topside. I don’t want to witness the collapse as part of the falling debris. 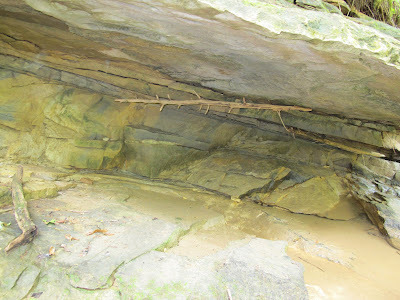 The thicker limestone layers are more durable and will last for much longer. 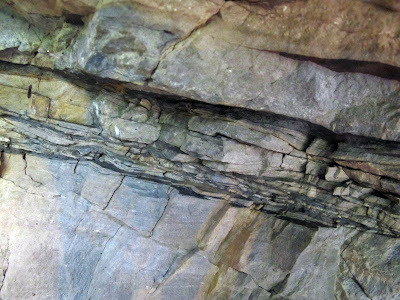 The fractures and the tilt to the bedrock are evidence of the prehistoric meteor impact that occurred here roughly 350 million years ago. It makes for some interesting geological finds. 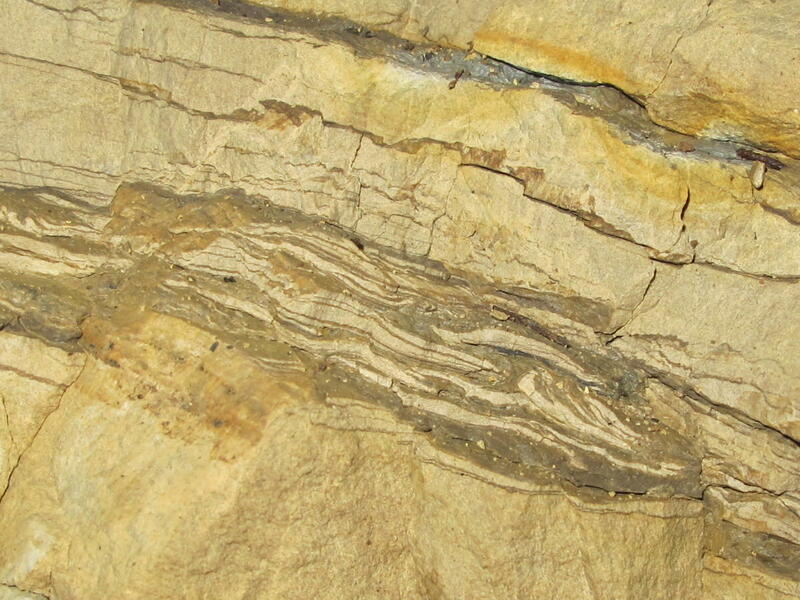 One of the things I find most interesting is the distortion of thin rock layers. When these layers were originally formed they should have been oriented horizontally in parallel bands. The layers I see are rarely like that. I see thin bands that are broken or twisted or stretched or compressed or otherwise reconfigured into a unique pattern. It’s amazing to think of a single event producing enough heat and energy to make the rock malleable enough to shape into a new pattern. This is one of my new favorites. Looks like someone made up a batch of caramel swirl ice cream. I’m not very knowledgeable about geology, but my niece is a super geologist. I’ll have to get her down here to explain to me what I’m looking at. A little foray through the field turned bad when I found a Crown Vetch blossom in my path. 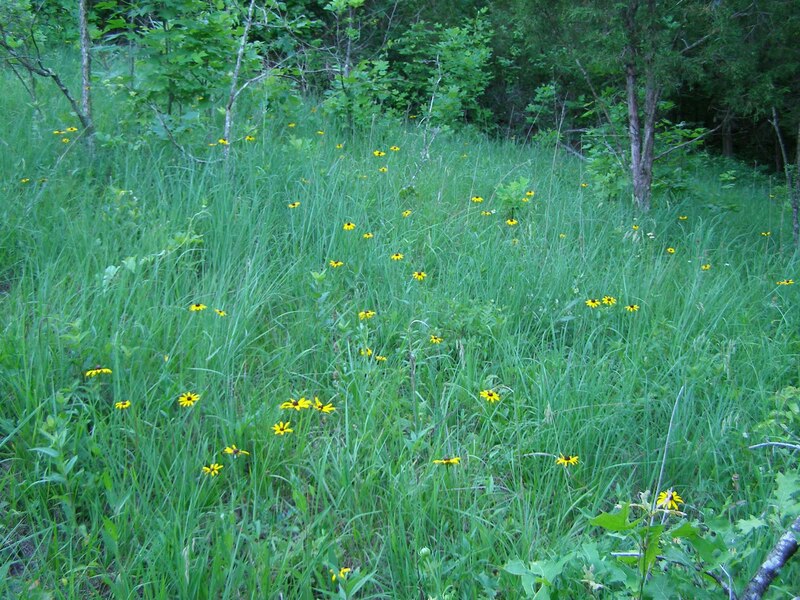 Crown Vetch was once planted on steep banks and other hard to maintain areas for erosion control and wildlife habitat. Having had some little success in that role, it went out on its own and made a name for itself as a non-native invasive species. It’s not a plant I want growing at Blue Jay Barrens. It starts innocently enough with a few shoots coming up through the existing vegetation. 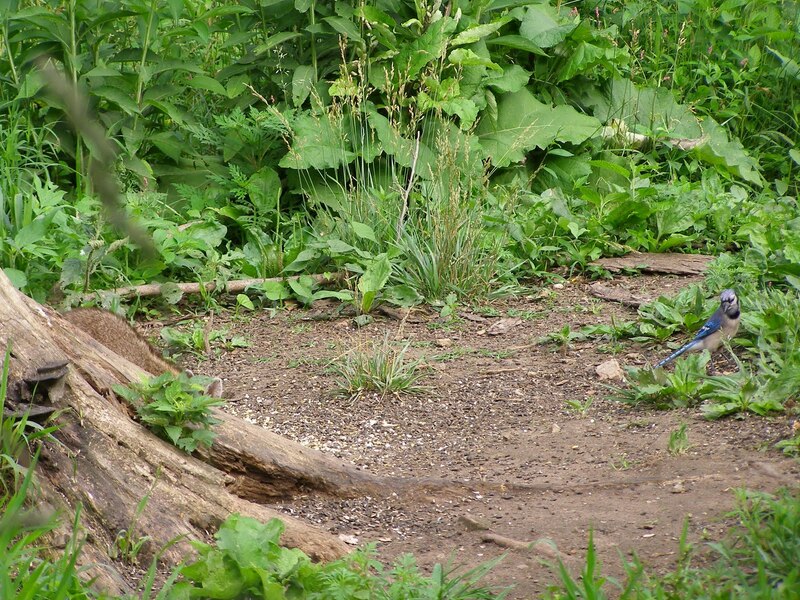 Its sprawling growth habit will soon cover and then smother the neighboring plants. The takeover is not rapid, so it may be several years before it becomes obvious that the plant is a problem. By that time it’s so well established that its removal becomes a very complicated process. The most troubling facet of this new infestation is its location. The new plants are growing right in the middle of the field. There are other patches of Crown Vetch growing at Blue Jay Barrens, but they are all near the road where they had been seeded in an attempt to stabilize steep road banks. The embarrassing thing about that is the fact that the agency I work for funded the seeding through a cooperative agreement with the County. It all happened over 30 years ago and it’s not something we would do today, but the locations of Crown Vetch infestations moving into my fields match exactly those of the seeded road banks. I guess that’s the cost of an education. Crown Vetch is a legume with a flower cluster resembling that of White Clover. 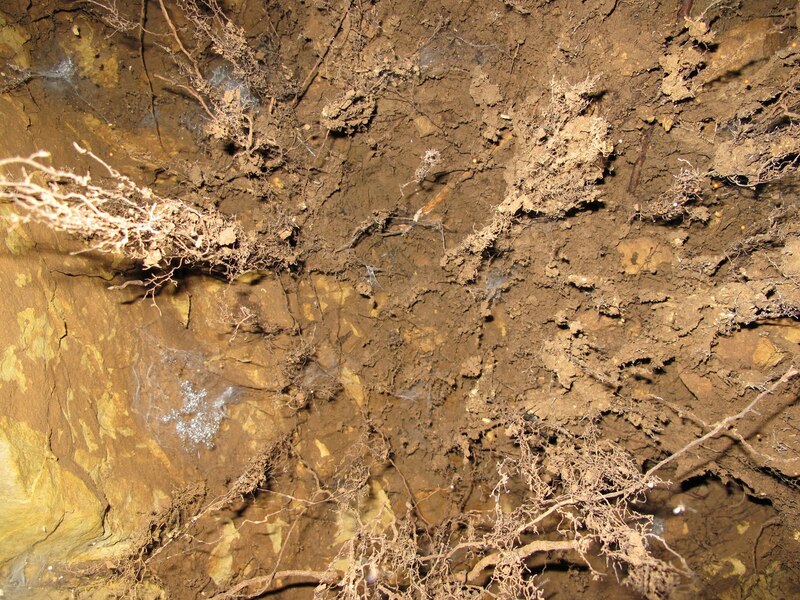 Its ability to utilize atmospheric nitrogen gives it an advantage on poor soils. The plants that it kills fall to the ground and decompose to release nutrients that are used by the vetch. It flourishes under these conditions. A solid mat of vetch plants eventually develops and little else will be found growing there. 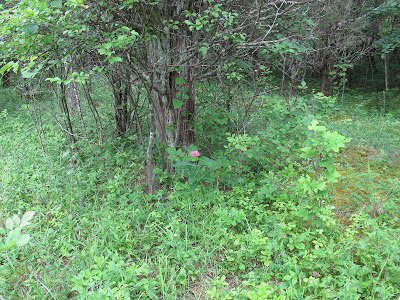 There were few enough plants in this spot that I could probably have pulled them all and eliminated the stand. I would have done that, but I was afraid the plants had produced seed in earlier years. Crown Vetch is a prolific seed producer and seeds in the ground will germinate and continue the infestation. I chose to spray the patch with glyphosate. This will kill all plants growing on the site and will produce a bare spot that will make it easy to spot any emerging Crown Vetch seedlings. The dead spot will be small enough that neighboring plants will quickly fill it in. While that’s happening I can keep an eye on things and make sure that it is clean of vetch. 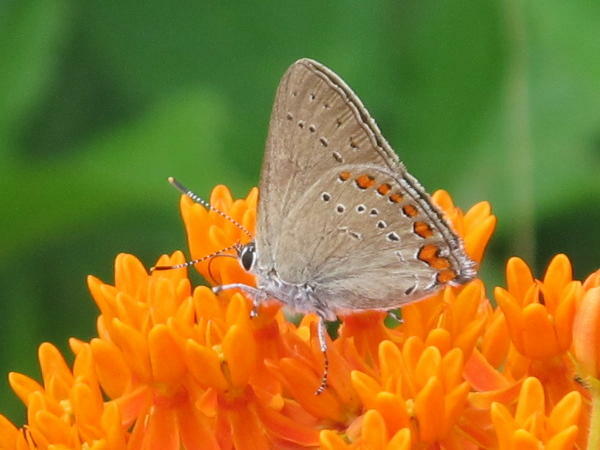 Butterflies are not the only creatures attracted to the Butterflyweed. The plant is certainly a stopover for any animal that has a taste for nectar. Bee species easily outnumber butterflies as frequent visitors. 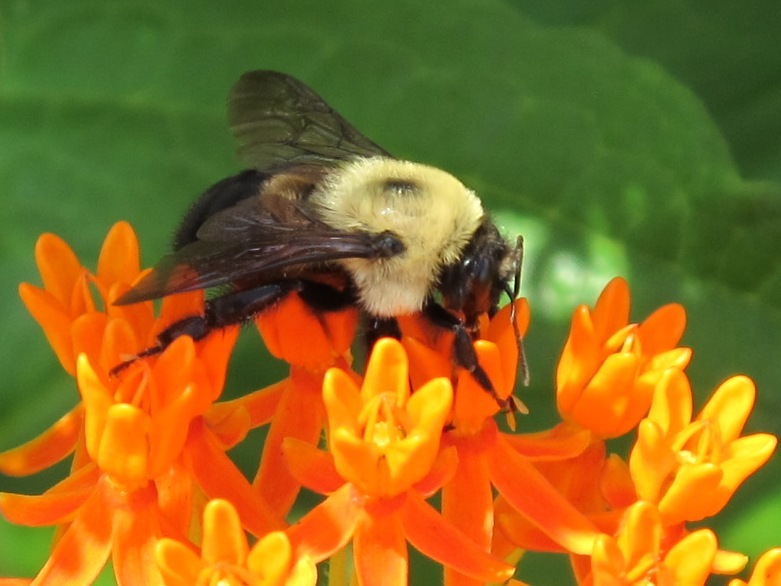 Bumblebee colonies are still building their numbers, so these large bees are only moderately abundant right now. Leaf Cutter Bees, which were very plentiful last season, seem even more abundant this year. 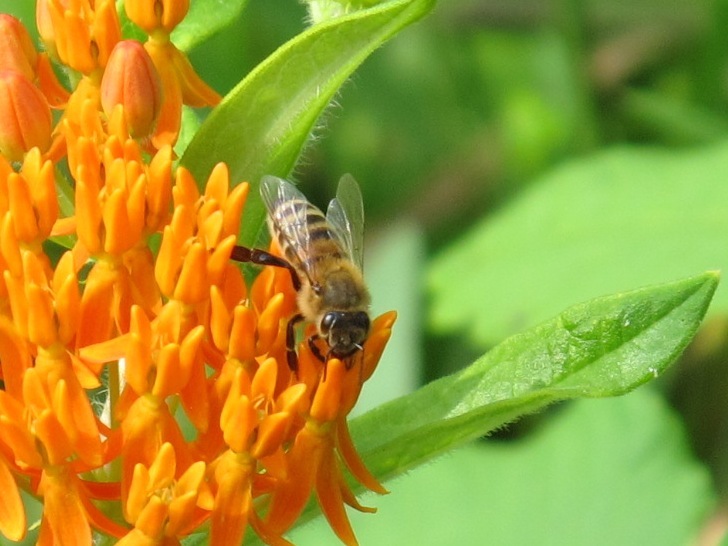 The Honeybee population fluctuates yearly and at present seems to be on the rise. Since it’s a non-native species, I don’t have any special interest in its management at Blue Jay Barrens. The black and orange of the Milkweed Bug blends quite well with the Butterflyweed flowers. 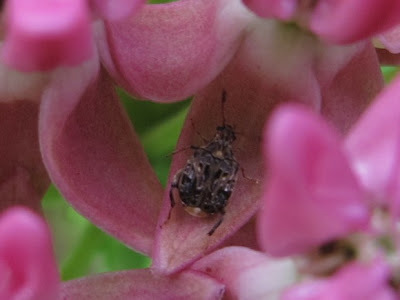 These bugs tend to visit all milkweed species on an equal basis. 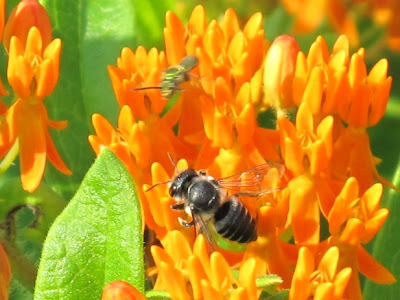 The black and orange coloration is common to several species of milkweed dependent insect species. It would be interesting to count the number of different species that visited a single Butterflyweed clump during a 24 hour period. First I’d have to be able to identify the various tiny bees that swarm the blossoms. 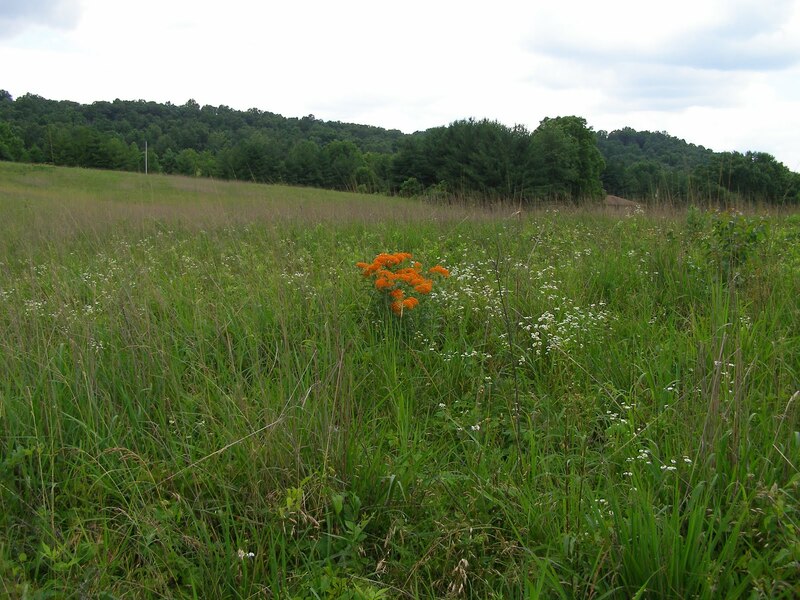 In the case of this particular field, I’d have to classify a Butterflyweed visitor census as a hazardous undertaking. In the 15 minutes I spent crouching next to this plant, I accumulated about three dozen chigger bites. Don’t restrict your viewing to just the flower tops. There’s also a lot going on in the lower levels. You can find the most interesting things by looking at an object from a slightly different angle. It doesn’t seem possible to have a cluster of flowers that has no Ambush Bug lurking beneath the petals. The camouflaged predators are nearly impossible to see, but once you learn the shape, they start to turn up everywhere. Heavy forelegs with hooked tips are perfect for snagging a nectaring bee or butterfly. 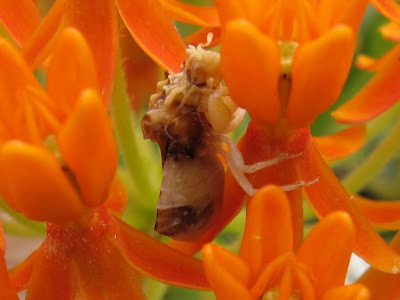 I’ve been fooled many times into stalking an insect with my camera only to find it dead in the grip of an Ambush Bug. The Milkweed Leaf Beetle also displays the black and orange pattern. This isn’t a very common species at Blue Jay Barrens. 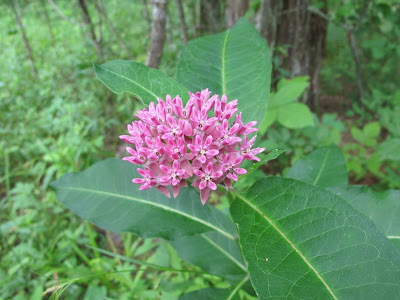 The literature describes it as being most commonly associated with the Swamp Milkweed, a species that is very uncommon here. Maybe the barrens are just too dry for this beetle. 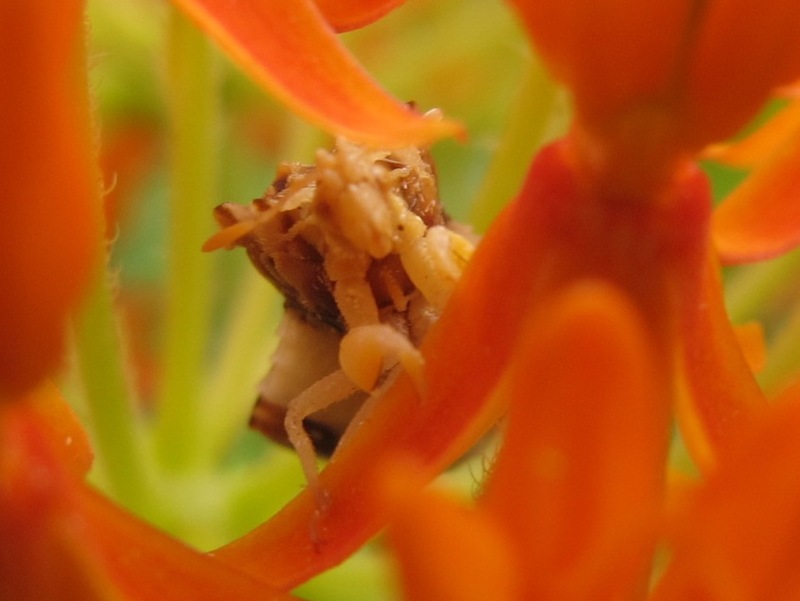 We can’t forget other small creatures that make their homes on the Butterflyweed. 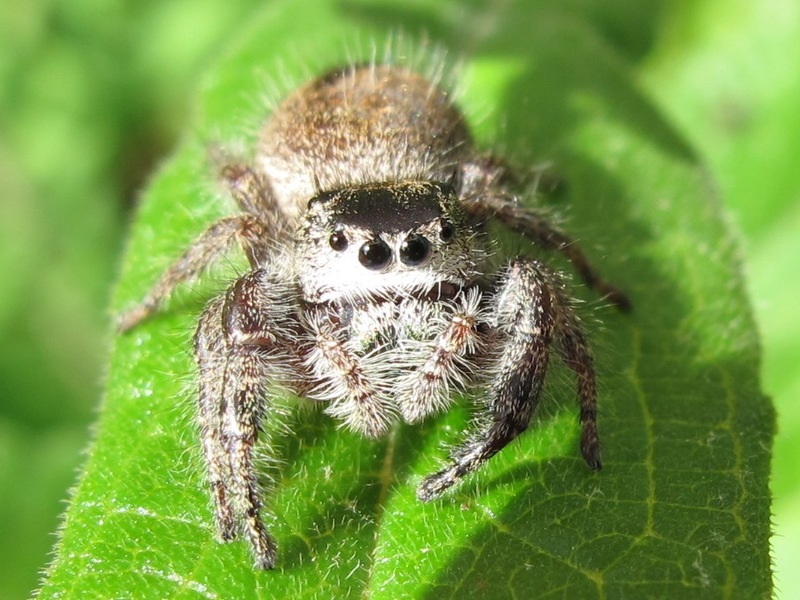 Jumping Spiders are the lapdogs of the spider world. Doesn’t this guy make you want to scoop him up and pat his head. I had a hard time getting a focused shot because the spider kept crowding up to the lens. The actions of the Jumping Spider make it look more intelligent than most dogs I’ve met. It’s a shame we can’t grow them to at least hamster size. 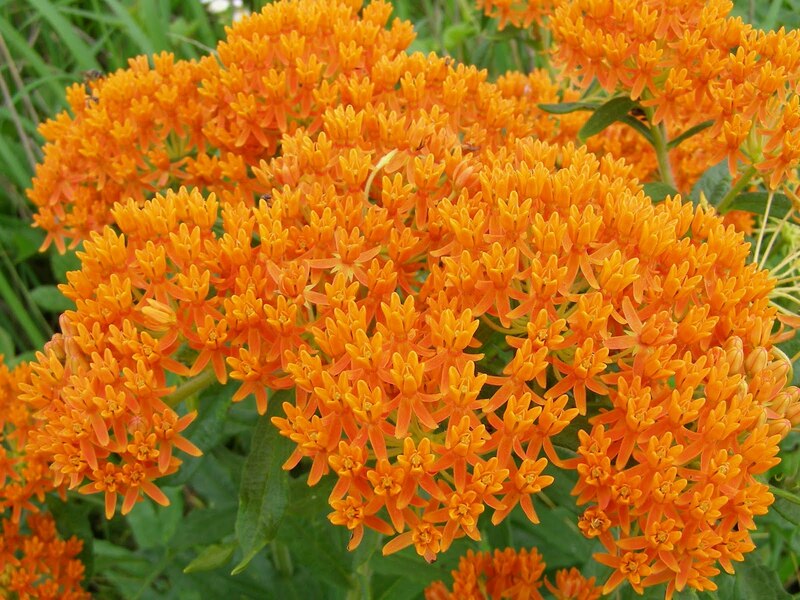 The Butterflyweed is joining the list of plants that are displaying an excess of vigor this growing season. Bright clusters of orange blossoms are popping up all over the field. I’m not a great fan of the flower itself. It just seems a little garish to me. What I admire is its ability to gather a large number of butterfly species in one place for easy viewing. I don’t know how butterfly vision responds to this display, but if I can see a clump of blooming Butterflyweed from across the field, I’m sure the butterfly can do the same. 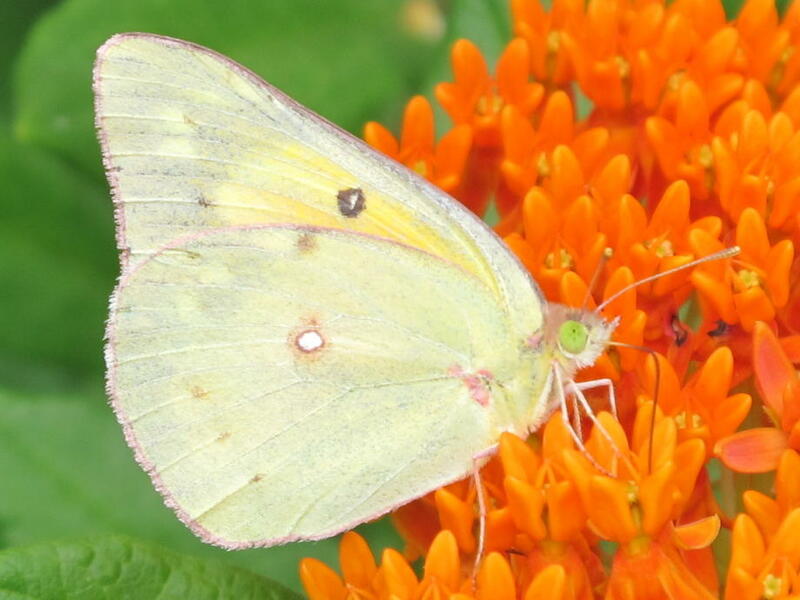 There was a definite reason for putting butterfly in the plant’s name. 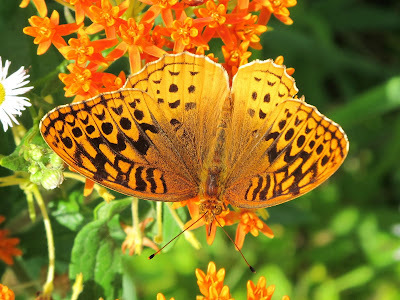 If you want to stay in one place and have the butterflies come to you, beside a Butterflyweed is a good place to be. I could sit for hours watching the butterflies come and go. Edward’s Hairstreaks have made a successful emergence. I saw several over the weekend. Coral Hairstreaks can’t resist the flowers of the Butterflyweed. 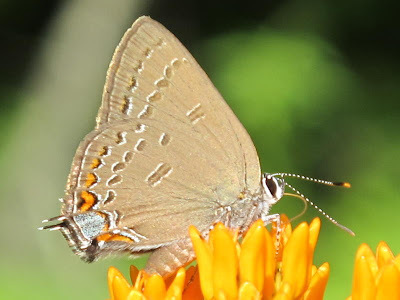 The orange spots on the hindwing might indicate the Coral Hairstreak’s preferred color. The flowers sometimes get a bit crowded. Some butterflies spend long periods of time drinking nectar from these blooms. It’s almost impossible to get a picture of a butterfly that’s not drinking. Great Spangled Fritillaries are around in moderate numbers. It’s nothing like the masses of fritillaries that emerged in 2009. Clouded Sulphurs are not yet abundant. They seem to reach their peak later in the summer. Not all of the butterflies are present as adults. This clump of Butterflyweed averaged two Monarch larvae per stalk. I once found a Monarch larva on a milkweed growing in the fence row of the elementary school. It was the first day of school and also my birthday. 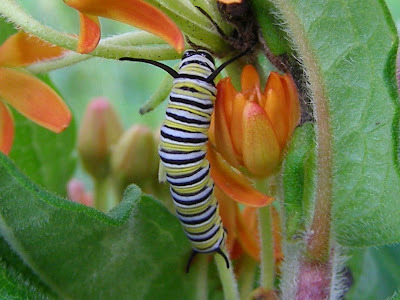 I was excited about seeing it, so I told my sixth grade teacher that I had seen a Monarch Butterfly larva. She told me it was correctly referred to as a caterpillar and that it wouldn’t be a butterfly until later. I patiently explained that it was still a butterfly, that it was just another stage of development. There ensued a scholarly debate which culminated in my winning a trip to see the principal. He agreed with my view, but said I should not argue with the teacher. I don’t know how he ever expected her to learn. 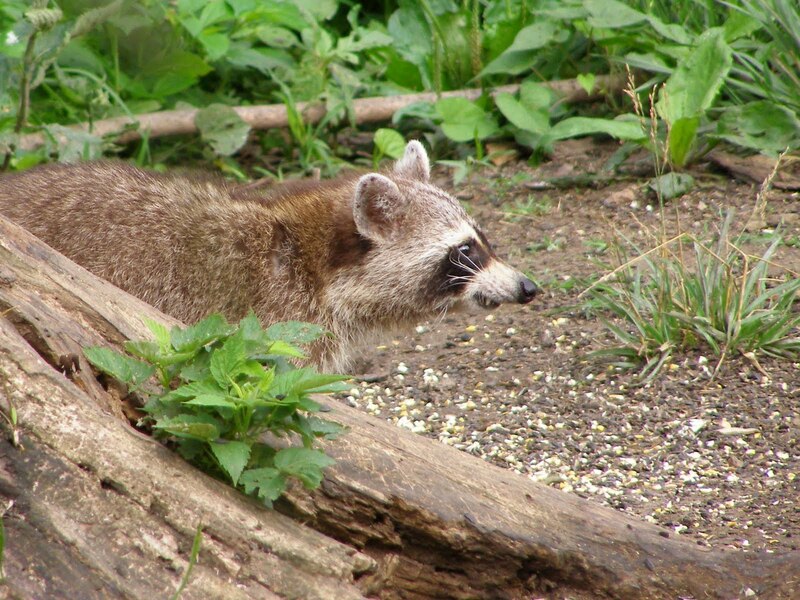 A Raccoon has been making early morning visits to grab some bird feed before the birds get to it. He used to make night raids and was about to destroy the feeder my son got me for Christmas. To stop this, I began putting a daily ration in the feeder each morning. By nightfall, the feeder is empty and of no interest to the Raccoon. 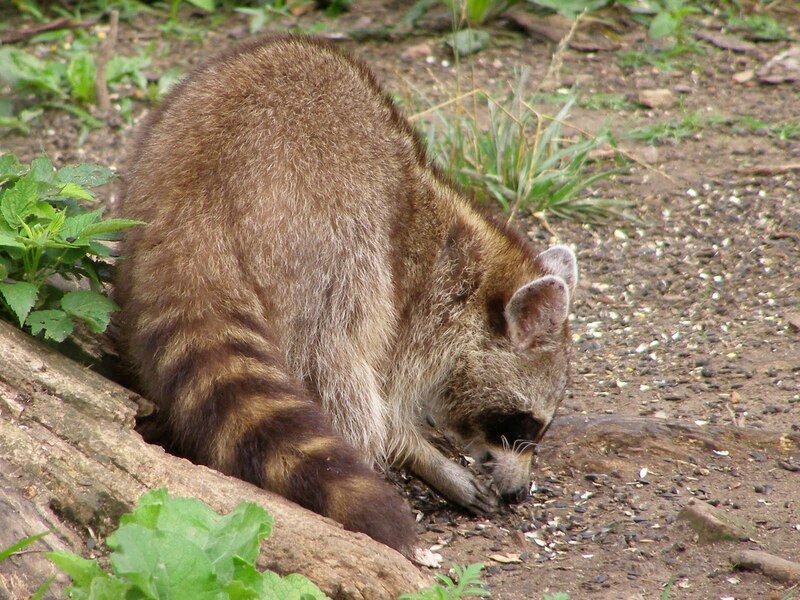 Daylight foraging is not typical behavior for Raccoons, but they’ll brave some daybreak sunlight if the prize is tempting enough. I suppose cracked corn will do until someone nearby has a garden full of ripening sweet corn. Several years ago, a person over the hill from us tried to raise sweet corn for market. 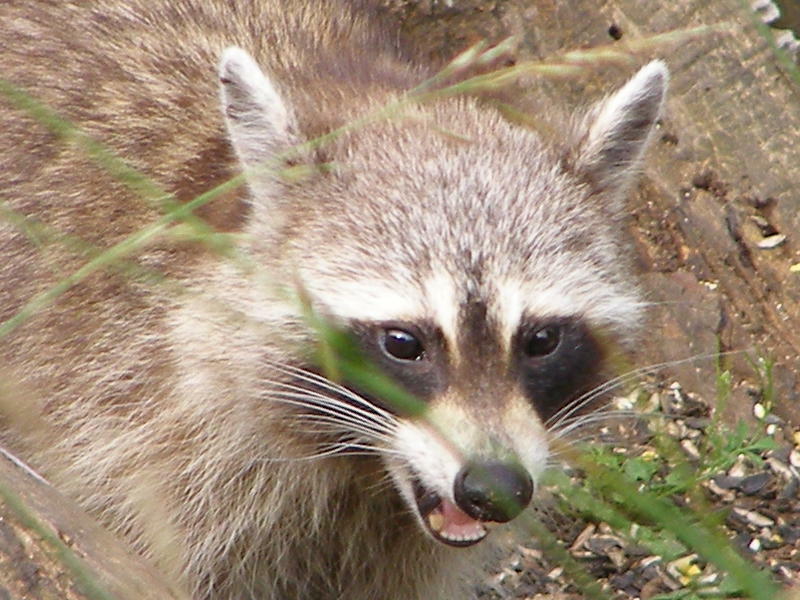 As the corn ripened I noticed a total absence of Raccoons at Blue Jay Barrens. 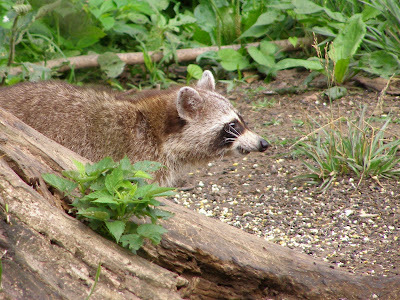 He said that the Raccoons overran his fields and left him with almost nothing that he could sell. Cracked corn can be awfully tough to chew. I’m probably at fault for not softening it up in a bowl of water. 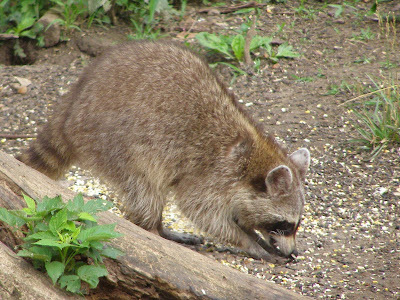 He alternates between corn and sunflower seeds. Sunflower is softer, but I imagine the hulls provide quite a bit of roughage in his diet. Wild animals must always be on the defensive against larger, more powerful animals that might take away their meal. The Raccoon is not going to willingly abandon his feast. Whatever’s coming, it must be big and powerful. I think these two should be able to share the feeding station without too much conflict. 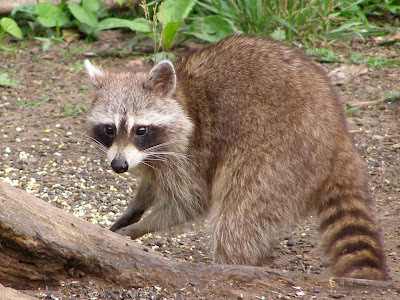 The Raccoon doesn’t stay around very long. As the morning brightens, he becomes more nervous and finally hurries off to sleep the day away. I had laid a tarp out in the yard to dry and when I went to fold it up I found a few dozen ants foraging on its surface. 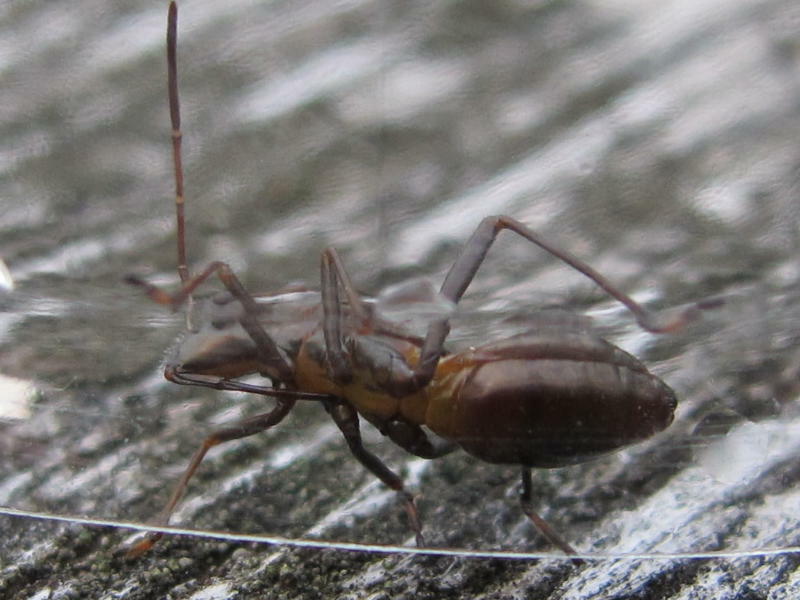 I noticed two or three different species running around as I bent to lift the edges in order to shake off the ants. That’s when I saw an ant run by that had a slightly different look than the others. I bent for a closer look and saw white markings near the front of the abdomen. This was definitely some type of ant that I had never seen before. 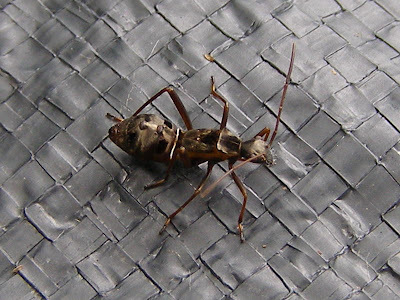 I reached behind me to pull my camera from its holster and crawled onto the tarp in pursuit of the ant. At close range, the ant looked even stranger. Was I seeing wing pads? What was an ant doing with wing pads? The wind was shaking the tarp and bouncing my subject all over the place. I decided to scoop it up and take it over to the picnic table for a photo shoot. At the table, I used a clear plastic ring to corral the strange ant. 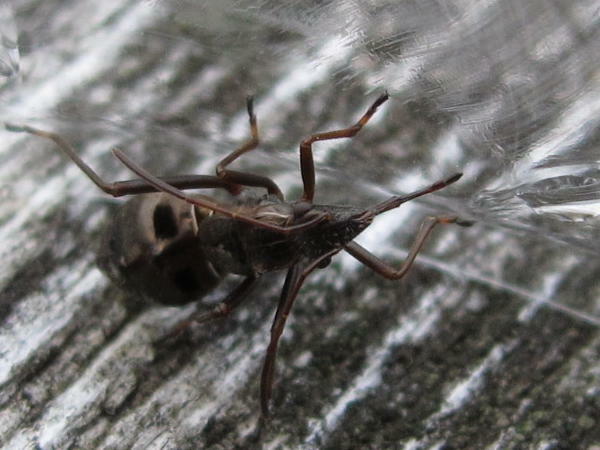 When my subject extended a proboscis to drink condensation from the plastic enclosure, I knew this was no ant. I had found a bug that was mimicking an ant in order to avoid predation. 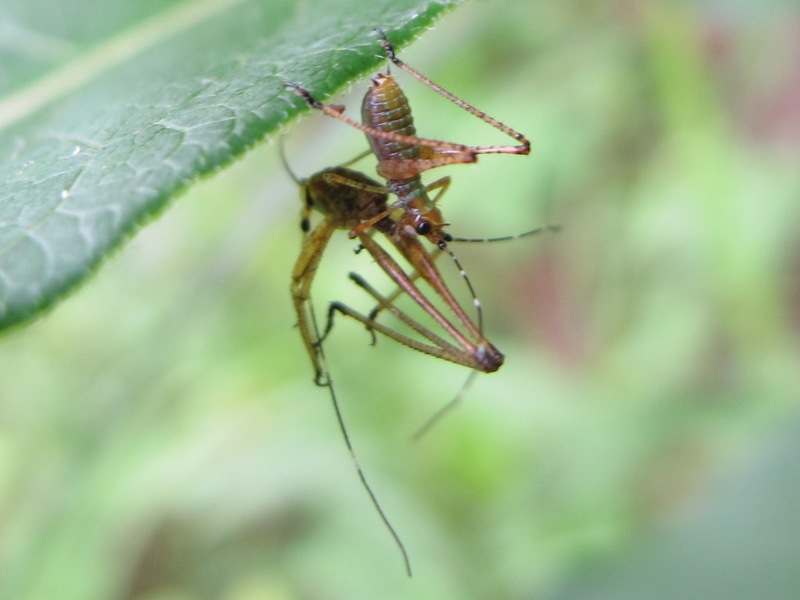 This is an immature nymph. As an adult it will have fully functional wings and will take to the air. If you can overlook the mouth parts, the bug does a wonderful job of looking the ant. Its movements are extremely ant-like. 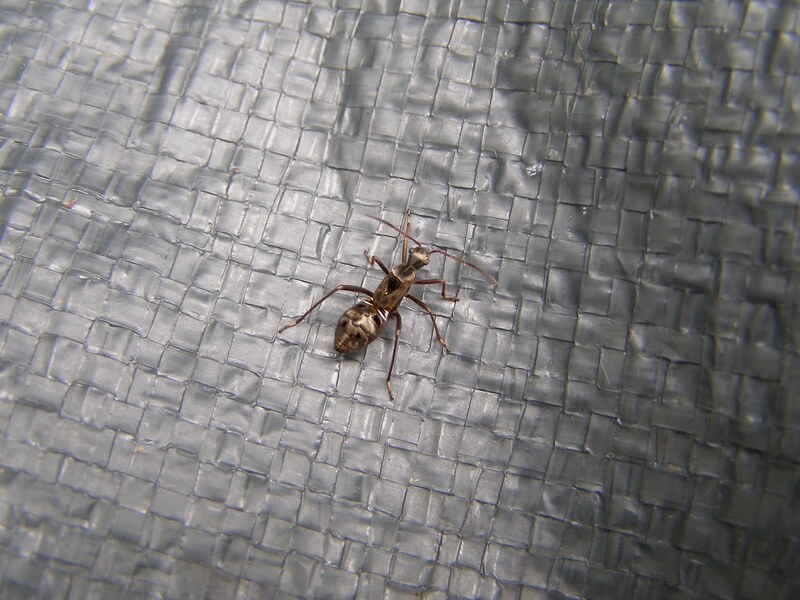 It ran across the tarp with all of the speed of a true ant. I love to find mimics, especially when they mimic one of my favorite animals. 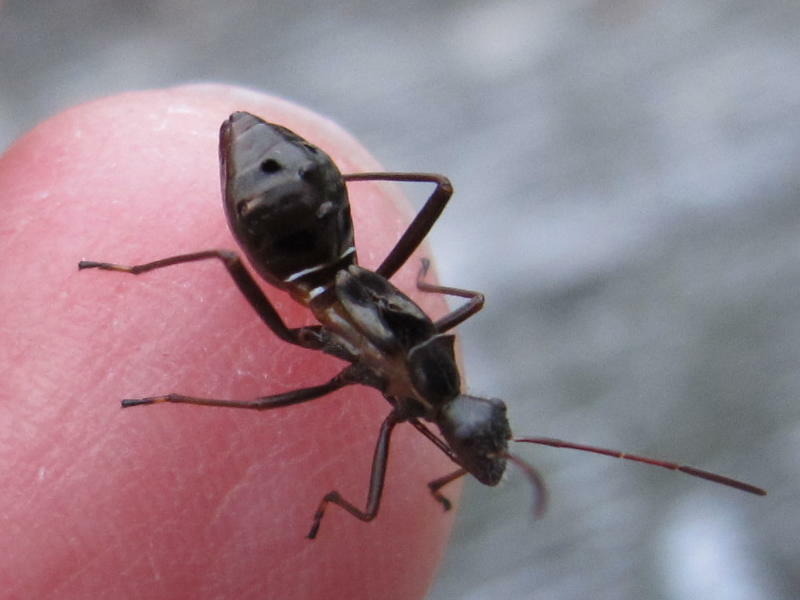 I believe this Ant Mimic Bug is Alydus calcaratus. 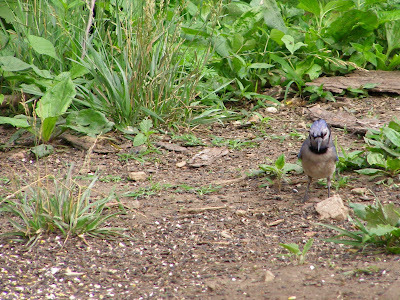 It’s a plant eater and considering the abundance of ants crawling around on the plants of Blue Jay Barrens, it should be able to spend its nymphal existence relatively unnoticed. The June prairie has a very distinctive look. 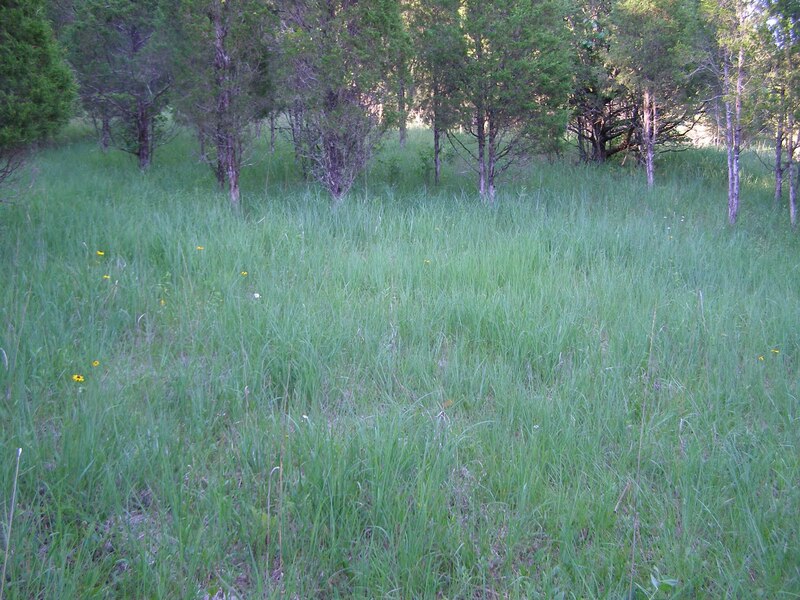 The tall grasses are putting on a lot of leafy growth and have a bright blue-green blush. Hidden among the grasses are a multitude of plants just on the verge of blooming. The anticipation of the soon to arrive blooms is similar to the feeling I used to get as a child during the last days before Christmas. Thanks to the abundant rainfall, there is an early show this year. Black-eyed Susans have bloomed in numbers far greater than normal. These plants normally behave as annuals or short-lived perennials. The right combination of weather conditions will stimulate germination of the seeds and create an uncommon abundance of plants. 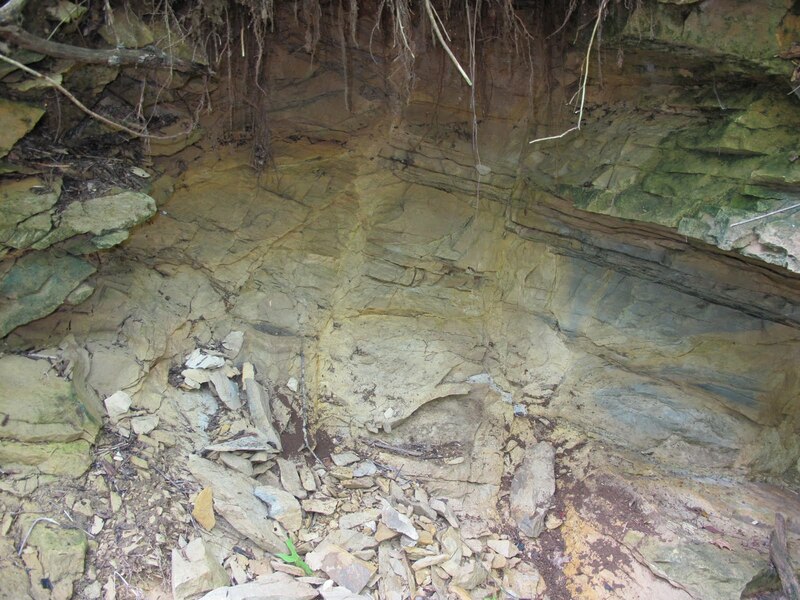 This is our source of early color. 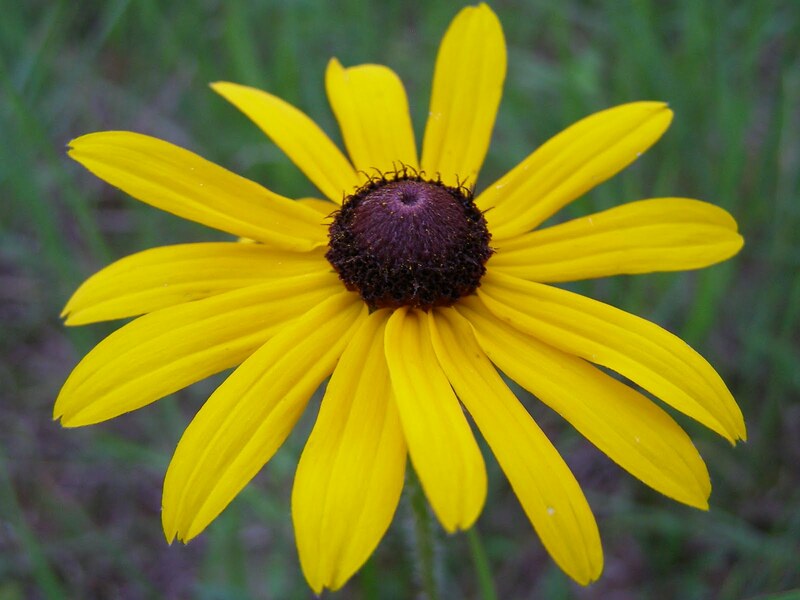 Black-eyed Susans are quite common across their range and in some places are thought of as a slightly weedy plant. It’s odd that so many people equate abundance with weediness. 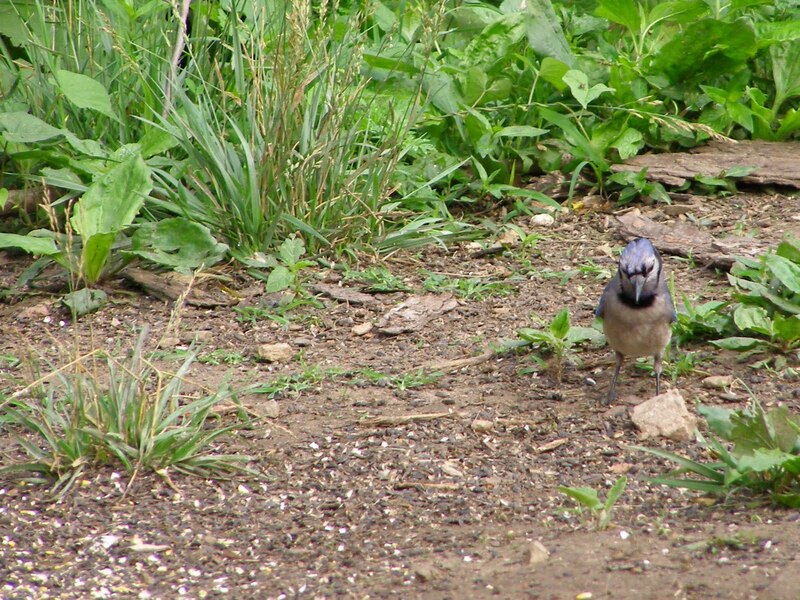 Its numbers vary greatly from year-to-year at Blue Jay Barrens and I see it as another native species maintaining its presence in the community mix. Besides color, it’s a major food producer on the prairie right now. This bee has picked up a nice load of pollen. Butterflies occasionally visit these flowers, but it’s mainly bees, flies and beetles that I find here. 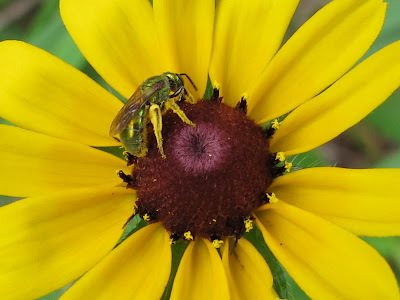 It makes me wonder if Black-eyed Susans are poor nectar producers. 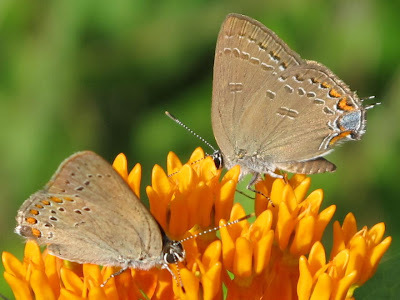 Of course, the mark of a true native plant is its ability to sustain an abundance of animals with its various vegetative parts and still produce seed for future generations. Various herbivorous life forms will feast upon the flowers, petals, leaves, stems and roots of this plant. It may end the season as a pretty raggedy looking specimen, but it will still achieve its primary reproductive objective. There are eight species of milkweeds growing at Blue Jay Barrens and I think the Purple Milkweed, Asclepias purpurascens, produces the prettiest flower. I find Purple Milkweed as isolated individuals scattered around the property. Occasionally I’ll find them in the open field, but most of the time they will be located in partial shade in somewhat moist soils. They don’t seem to be as capable of producing vigorous rhizomes as the Common Milkweed. Maybe a large group of these blooms would be too pretty for the eye to bear. The flowers are held upright at the top of the stalk. 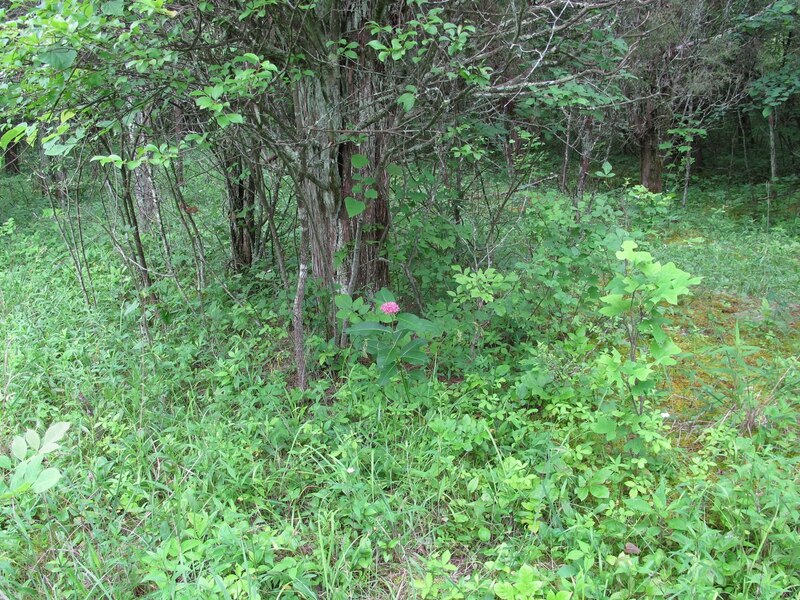 This makes them highly visible from a long distance, so it’s pretty easy to find the plants when they are blooming. Like others of its genus, Purple Milkweed flowers are insect magnets. 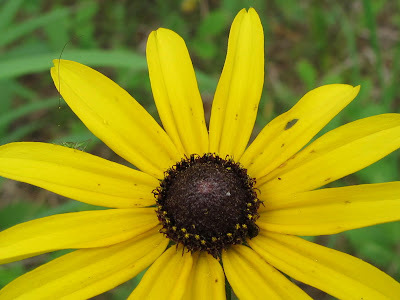 This flower head had quite a few of these little beetles crawling among the petals. As soon as I saw the beetle, my mind declared that it knew exactly what I was looking at. Frustratingly, it refused to release the information to me. I know I’ve seen it before and identified it before, but the ID just won’t come to me. I’ll remember eventually. Is it considered learning something new when you relearn something you’ve forgotten? The leaves are only sparsely haired on the upper surface. This gives them a shiny, dark green appearance. I always think it has a tropical look to it, especially when it’s growing in a shady area. There are normally a few places along the leaf margins that show a little wave or curl. This tends to make each plant identifiable as an individual. There are also a lot of insects that find the structure of the milkweed suited to their predatory or scavenger needs. This little hopper is feeding on some type of tree cricket. I’m assuming it found the dead cricket and is just taking advantage of the situation. In a fair fight, I just don’t see this guy being able to outdo the slightly larger cricket.